Have renovation ideas but don’t know where to start? 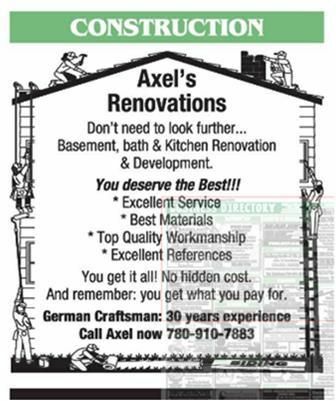 Let Axel Renovations get the wheels in motion! Our years of experience serving Spruce Grove and surrounding areas with professional renovation services have given us the tools and vision to finish any job right. Whether you’re looking to invest in your property by finishing your basement, remodeling your kitchen, or overhauling your bathroom, the team at Axel Renovations will leave your property looking better than ever. New cupboards, countertops, and flooring as well as a fresh coat of paint are only the beginning. Just let us know what you want for your space, and we’ll make it happen. We work with more than your home’s interior. We have the tools to expertly repair leaks in foundations, build beautiful fences and decks, and install eco-friendly windows and doors. Call today for a free, no-obligation estimate.